Video conferences aren’t just the stuff of blockbuster movies and mega-corporations any longer. Small and medium sized businesses are now realizing the huge cost-benefits of employing video conferencing in their day to day operations. Advances in computer and data technologies have put video conferences within reach of even the smallest entrepreneur, and they are quickly becoming a common tool for businesses of all sizes and descriptions. Video conferencing allows coworkers to successfully collaborate on projects over great distances, enables more effective communication between sales representatives, management and clients, and increases a business’ productivity while helping to reduce its operational overhead. For small businesses trying to compete in an ever expanding global market, video conferencing is the way forward. New cloud based technologies are making video conferencing available to businesses of all sizes. It is no longer necessary to install costly hardware, or to reconfigure your business’ network to take advantage of what video conferencing has to offer. Cloud based video conferencing services, like IVCi and Cisco Telepresence, are making web conferences possible for anyone with a high speed internet connection. All that is needed is a laptop or PC, a web camera, and access to a web browser. But if video conferencing has become as easy as logging on to a computer, why aren’t more small business owners using it to increase their sales and grab a piece of the global market? Perhaps, because they still don’t see the distinct benefits that can be gained from video conferencing. For years, business travel has been a necessary expense for companies doing business both nationally and internationally. But with today’s technology, many business trips can be replaced by video conferences. This can save small businesses large amounts of money in travel fees, hotel accommodations and expense vouchers. The cost of video conferencing is negligible, and the return on investment is substantial. While not all business meetings should be conducted via web conference, a vast majority of business travel can be eliminated by relying on video conferences for general business operations. And, with today’s bandwidth options, video conferencing is a no-brainer. Video conferences increase employee productivity in a number of different ways. First and foremost, it allows for more effective communication between employees, management, and out of town clients. These face to face meetings are far more productive than a series of emails or long distance telephone calls. By reducing the need for long distance travel, video conferencing also helps to relieve the stress and burn-out that affects many business travelers. That translates to less employees turn-over, and employees that are always at their peak. By using video conferencing to replace travel, business owners and office managers will also be spending less time planning trips and more time addressing the needs of a growing business. Video conferencing systems have come a long way since their inception, and can provide more than just a face to face discussion. Many web conferencing services make it possible to include PowerPoint, whiteboards, and multimedia content in your online meetings. This makes it much easier for staff members to give presentations remotely, and to collaborate with other employees on important projects. Business travel requires a lot of planning and coordination, and that takes time and money. 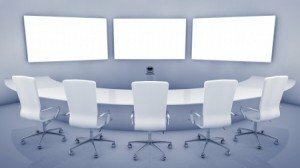 Video conferences can be arranged quickly, and coordinated with a few emails. Using a cloud-based web conferencing service, meetings can be easily arranged with people in different states and countries, all without anyone needing to flag a cab to the airport. Spur of the moment meetings, or important follow up meetings, can be quickly arranged and conducted with all of the ease of a telephone call. Video conferencing answers a lot of questions for today’s entrepreneur, not the least of which is “How to compete in a global market without breaking the bank on travel expenses?”. With the latest video conferencing technology, small business owners can begin to compete on a larger playing field, while keeping travel expenses to a bare minimum. Web-based video conferences are the business model of the future, and are poised to change the way that small and medium sized businesses operate in a fast paced, over crowded, marketplace.